I remember I went to a youth conference at the age of 18 called Acquire the Fire in Hamilton, ON. It was my third year going and I definitely was more open to going to this huge conference with so many youth. This was a non-denominational conference (not sure why I am writing this part). Anyway, I went and the point I woke up with today is that the Lord came to me like a rushing wind and pouring a passion unto me. In that time of my life so many things were happening. • I was in a relationship with a guy. • I was always arguing with my dad. • My dad and I had such a bad relationship, it was sad and upset me. • I was independent from God because • I didn’t ask for his wisdom at all. • I was living in the flesh a lot. • I was bound to lust, seduction and manipulation. • I did whatever I wanted – without a clue if it was what God my Heavenly Father wanted. • Wasn’t able to commit to jobs well, I didn’t take them seriously and I took it for grantid. • I was miserable in my decisions a lot of the time cause it caused me to get hurt a lot. He came to me in my mess, and even now I get into messes that God is working on now. Now I know and better understand through a revelation Father God allowed me to see is the power of the cross and the power of the blood of Jesus. Throughout these years the Lord gave me layers and layers of this but I couldn’t get it all until now. Its rather divine and planned. I love the sacrifice of Jesus  its the most loveliest love stories I ever knew. The way he walked and talked and then died for us is beyond anything. Blah, its not a story – its TRUE! That’s what makes it even better, its reality. He died for my sin, his cross was so heavy because our sins were so heavy (so many sins). And he bled and bled and bled – shedding his blood for us to cover us in it spirtually so that our chains of slavery to sin would be broken. So when we allow and accept the Salvation of Christ – we accept his protection. We accept his sacrifice. We accept to be covered under the mantle of his blood which as it spiritually flows over us it reaches every crevice of our soul, all the darkest spots, all the hardened heart or the broken heart and cleanses it for us. And that is his grace… In the meantime while we are covered the Holy Spirit does the work in us through our lives truly by grace and because we have a purpose. There are many Canadians who “love” Justin Trudeau, and as it said in the dream that is what was depicted… he was a gentle man who had charm. Also, I saw that he lifted up the actress to ask Canada a question.. which was [if Canada could tell her a joke, as friends tell each other jokes… to make each other laugh.] In a way, this is encouraging Canada to laugh and smile but Canada is insecure about their friendship. Right now the friendship with Canada is perhaps “in the clouds” because the PM has not made a solid decision yet. But we shall see what happens in the next couple of days when he is actually ordained PM of Canada. Today I had a dream where I saw myself walking into a hospital with this tall man, very kind and wearing a black trench coat. I remember we were following this girl that I knew who was broke and she ended up going into a hospital. So we walked into the hospital and we saw her walking quickly to where she was suppose to go as she was directed by the staff. Somehow we knew we weren’t allowed to go into where she was and this man just went in and took me with him. (I will tell you in advance that this man looked like PM Justin Trudeau..) I heard yelling down the hall and we were walking into this chaotic and noisy place. When we walked around the corner we saw that it was a woman complaining and worried about her son. Her son was on a wheelchair of some sort and asking the receptionist if they can do another check up on him. The tall man went to the ledge of the window of the receptionist and leaned on it with his elbow. And as I walked by I saw this young boy sitting there, with red stuff on his face and his mother said “I just want him to be normal again” in anxiety and I walked by and said “he’s beautiful” in a whisper. I looked at the tall man and he looked at me and was falling in love because he saw compassion. Then he took my hand and we took a walk and I saw this other woman join us. She was not the focus at this point, it was just me and this man. He was charming and handsome and he would share much wisdom with me. Then I remember he told me to check into his pocket and inside his pocket he had a pair of reading glasses and some coins. I felt him saying or an idea came to me inside me saying “if you get the one penny he will stay with you” so I was hoping to get that penny but instead I got a nickel (5 cents) and it was an old one too – it looked American actually. Then the other woman (who looked exactly like Rashida Jones) came into the focus and she asked me if I could tell a funny joke, and I was not very confident to tell this woman a joke. Then I saw the tall man be a gentleman to this other woman and picked her up from her armpits (she was wearing a blueish trench jacket) and I became envious for that reason and jealous. He was very nice to her, after all the time he was nice to me. It came to thought that he was interested in her romantically but He wasn’t. I had discernment in the dream and I discerned that He was respecting her as a friend and has no intention to be with her as I was his. She simply asked me to say a joke, but it was also in my thoughts that idea “would he leave me if I didn’t do good at this?” “what if his favourite thing for me to do would be to make him laugh…” and I saw myself in centre stage, wearing a very cute yellow dress and shy and brushing the dust off the bottom part of my dress while straightening it, nervously about to start and I woke up. I asked God about this dream because to be really honest It didn’t make sense to me. I have no interest in Justin Trudeau or in any male whatsoever except for the Lord. So he reminded me of the story of Hosea how Hosea was to place himself as an example of God and he was told to marry Gomer who represented “Israel”. God married Israel, but she prostituted herself to other gods but God still loved her. God uses woman as an example of a country. Just to make it clear hehe. What I learned from this dream was that tall man was Justin Trudeau, I was representing Canada, and the other woman is Jewish and African. When I saw this… my being shouted within me! 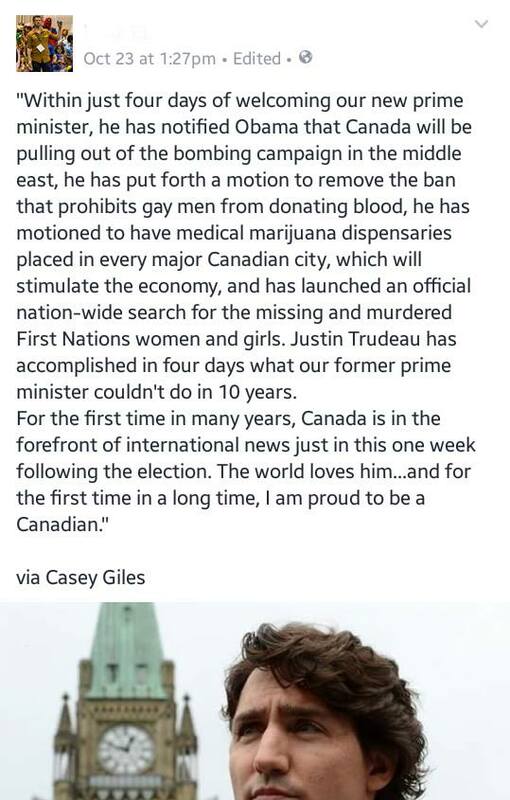 Canada is loving the Liberal PM at this moment, everyone is commenting about how handsome and charming he is. How he will change things in this country etc etc. Canada has fallen in love with Justin Trudeau and Justin loves her too – for he has seen her compassion for others and he loves it. Anyway, as we walk ( which is the journey of life ) we eventually reach a point where this other country is sort of there but isn’t fully in the picture yet – I’m talking about the Jewish family now. Following this Canada is walking with Trudeau and as charming as “wise” as he is he shares much things with her and he tells her to look into his pocket. I saw reading glasses: he reads a lot and knowledgeable and studious… and then I saw one penny and the rest were dimes, nickles etc. He told me to grab and choose one – and I remember hoping that we would find the penny but it was an American nickel which was different. So, something to do with American money. Then I remember this woman asked Canada to make her laugh as they were FRIENDS. and then the man lifted her up on a higher level so she could speak and ask the question (Jews will have their say in Canada) and Canada got jealous for the insecurity that their handsome PM will leave them for another. But the TRUTH was that the intentions of the PM wasn’t to be nice to be with the Jews, he was nice because he was their friend and thats what friends do – they help each other. So then Canada was put in the spot and she was shy and unsure of herself to say what she had to say. Canada will eventually become friends with the Jews again, cause there was some distance and then Canadians will be jealous cause there is to much happening with the Jewish people and then the truth is Canada is friends with the Jews and because of their friendship it will lift up the jewish people. *on the side note, God has used me as an example of the body of Christ. When I have felt tired, I have seen the whole body tired. When I have been discouraged, I have seen many discouraged – its so weird. Anyway, if it was PM in love with the Body of Christ that would be amazing and the church needs to love the Lord more then Trudeau but more to respect him. Anyway… the Love of Christ is merciful. I felt a movement in the atmosphere last night, this nation will be shaken and there will be a great awakening here in Canada. The body of Christ is realizing the Sovereignty of the Lord in this matter and those who have been quiet are now speaking out! I experienced a lot of anxiety and worry in the atmosphere in Canada. There was a huge shift in the world. There was a new “freedom”, a new change a new Prime Minister and a bunch of worried folks.One thing is – whatever happens keep praying for Justin Trudeau. He needs our prayers church! He needs our prayers. Jesus is with us, and we side with Christ. Christ will be lifted up! Voices will cry out to Him to change this nation and it will! We are shaping history!